Frederick was born in Hadleigh in 1897. The 1911 Census report him living at home with his mother, Amelia and siblings, Alfred (16), Edward (9) and Jessie(7) at 19 Benton Street, Hadleigh. His older siblings; William, Harry, Florence and James had all left home by then. As a young man he was employed on the 'rope walk' at Brett Works on Pound Lane. We are not exactly sure when he enlisted into the army, but it seems like many other young men from Hadleigh, Frederick joined the local territorial battalion, the 5th Battalion the Suffolk Regiment and if we assume that Frederick had joined the battalion before war broke out then we know that he would have been mobilised on the night of the 4th/5th August 1914. He was one of five brothers who served during the great war. We are not sure of the whereabouts of Frederick's medals but he would have been entitled to the above three. Despite his physical injury his eventual cause of death was dysentery. 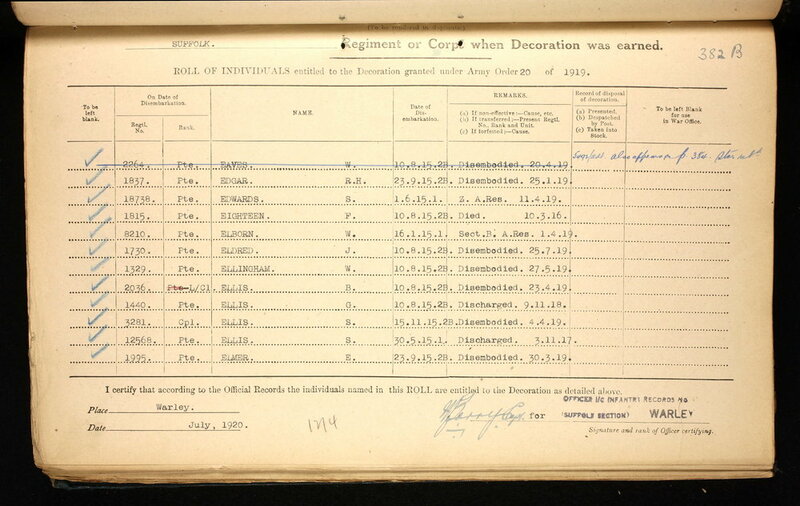 His body was returned to Hadleigh for burial and on Wednesday 15 March 1916, Private 1815 Frederick Charles Eighteen was given a military funeral. The newspaper reported: “In the absence of a gun carriage, the coffin, covered with the Union Jack, was conveyed from the house in Benton Street to the church and from thence to the cemetery. A few days later they were relieved and returned to the reserve trenches where they discovered that the attack had cost them dearly; 11 Officers and 178 Other Ranks were killed, wounded or missing. Although official records suggest that many of the Suffolks went missing on or after the 21st Aug, we now believe that they were actually lost during the advance on the 12th. Frederick would have been involved in the 12 August battle. An entry in the 1/5th Suffolks casualty book states that Frederick was listed as wounded on 14 August 1915 with a gun shot wound (GSW) to the right leg. He was evacuated to hospital in Malta and eventually back to England. In March 1916 he was in the Brand Lodge Red Cross Hospital in the village of Colwall, amid the Malvern Hills of Herefordshire and it was here he died, aged 19. Frederick's older brother Lieutenant William James Eighteen also served during the great war with the Oxford and Bucks Regiment. He survived the war and was a member of the war memorial naming committee. He also became the Hadleigh Cemetery Superintendent and lived in house at the gate – Cemetery Lodge. We hope that this page has been able to tell the story of Frederick Charles Eighteen. If you know of any information which might help to add to the story then please get in touch.